Piracy always was an act of rebellion. What may have caused good, honest people to turn towards such a hideous lifestyle? Were they always criminals? In some ways, perhaps they were. In other ways, the kinds of sailors they were originally employed under (or press-ganged into service with, to be fair) were almost more monstrous than the pirates themselves. 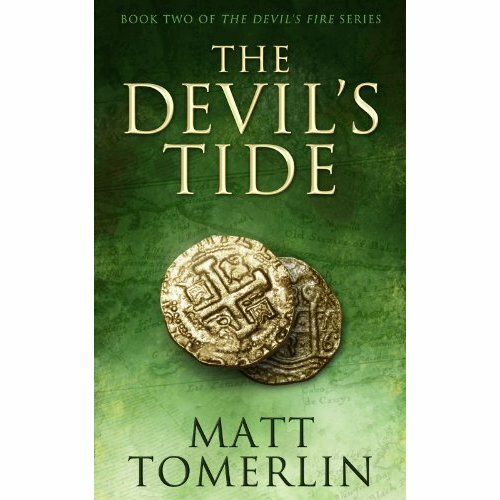 In Tomerlin’s second Devil’s Fire novel, The Devil’s Tide, this becomes more and more apparent with the introduction of famous pirate hunters and the criminals they tracked to world’s end and back. Enter Kate Lindsay. Again, Tomerlin masterfully weaves history with the fantastic, and merges two worlds into an amazing novel, in which this character takes the lead yet again. No longer held hostage, she has taken up the title of pirate, and once again escapes the dull fate of being returned to London. Having escaped the fiery wreckage of the Harbinger, she finds herself stranded in Nassau, governed by the pirate hunter Woodes Rodgers. Of course, because Kate has long given up a life where everyone else tells her who to be and how to behave, she takes her fate into her own hands. She is a rather strong major character, but again – being a pirate, is she really a hero? Does it matter if the book has a hero or not? I was told by someone very wise that all good villains and all good heroes alike should be fighting for something they think is absolutely right. So, let’s then talk about the character Kate wrapped up in her schemes of escape, Benjamin Hornigold. The pirate-turned-lackey-turned-betrayer is definitely an interesting point of view in the earlier chapters of this book. Hornigold took a pardon from Woodes Rodgers, and turned against all of his former allies. This, unfortunately, incited the rage of Blackbeard, something any sensible pirate didn’t wish to do. The resulting capture and death of Hornigold was possibly the most grotesque and well written scene of the book, in my opinion. Failing Blackbeard’s trivial word games, Hornigold’s fate was already sealed. And by sealed, he meant in a wooden coffin fixed with a porthole and pushed over the gunwale. It was terrifying to read of this horrible encounter. I found myself basically glued to the book, unable to stop turning the pages. 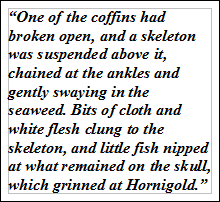 The serene way the underwater graveyard where Hornigold was left was described in such a juxtaposition compared to the horrific way this character was being killed. It was so much more torturous and slow than a death by keelhauling, which was commonplace during this point in history. It was masterfully described, and the setting was portrayed stunningly. I had never rooted for a character to die more, with George R. R. Martin’s Joffrey as the only exception. They say it is a mark of mastery if an author can sway his readers to hate a character. Tomerlin has accomplished this in both of his Devil’s Fire novels that I have read so far. If we speak of Hornigold, then by all means, we need to speak of Blackbeard. In the beginning, it was hard to tell exactly who the enemy was – was it Guy Dillahunt, the captain sent by Woodes Rodgers to apprehend Kate and Hornigold? Was it Nathan, the one-armed survivor of the Harbinger’s burning, conspiring with the very governor who spared his life to catch up to Kate for betraying him? Or, was it Annabelle, the whore from Nassau who was shipped away and ended up traded by Blackbeard for Hornigold’s life? Tomerlin’s point of view chapters constantly kept me on my feet, and kept the pages turning. I was always in a state of shock at the events that unfolded during each chapter. Blackbeard is one of the most written-about pirates, after all. A Pirates of the Caribbean film focused on his demise, as did the book On Stranger Tides from which the film was derived. Legends about his death have been passed down through the lore for centuries, always inspiring new ways for him to die. They say, after his beheading, the body swam around his ship three times before hopping back on board. Well, being as realistic and violent as The Devil’s Fire trilogy is, none of that nonsense was about to occur. Leave it to Kate to create the hellfire that swallowed Blackbeard back up in his final moments. That was most excellent. Once again, Tomerlin completely blows the stereotype of the romanticized pirate straight out of the water. In this book, I’m left less marveling over the now-familiar structure of the chapters – point of views of different characters – and more wondering exactly what a protagonist is. Are all the characters villains in their own rights? Or perhaps, all of them end up antiheroes? Is there any honor among thieves, after all? Do Kate and the others do what they have to in order to survive, or are their actions driven by something much more insidious – such as the lure of treasure or the freedom of the sea? By the way so many characters die, the sea in this world is more dangerous than ever, and yet still they choose to sail. Be they heroes, villains, demons, or a cross between all three, I think these characters are some of the best written pirates I have ever read. I want to point out again the fact that The Devil’s Fire trilogy is indeed self-published. I mean, if you walk into a bookstore, you see shelf after shelf of “traditionally published” books that you could choose from. You can run your hands over the covers of the new releases and flip through their pages. In the self-publishing world, it is hard to be able to afford new readers this experience. We as readers have to take our chances and decide to purchase without much of a preview, or without being able to heft an edition of the book in our hands to the counters. We have to go by our gut instinct after reading reviews or synopses in order to decide to purchase or not. It’s tough to get your voice out there at all in a world increasingly less concerned with good art and more concerned with good paychecks. Self-published and newbie authors alike face this difficulty. It’s more and more important to give these authors and their writing the chance they deserve. Hopefully this review will convince you to pick up the entire series. I’m crossing my fingers. Reader to reader, I’m telling you it’s more than worth it. So sentimentality aside, and all that said, my overall opinion of the second book in the trilogy is overwhelmingly positive. I thought it a great next step in the series. The development of the leading character, Kate Lindsay, takes a much stronger turn, to say the least. It leaves me wanting to read through the third book as quickly as possible – to dive right in after the grand adventure of the last. I believe it even more well done than the first book, and I’m hoping that fact trends upward for the next one. For those readers who are looking to get away from the traditional pirate tale, and move into something more historical and gory, these books are the way to go. Who knows? Perhaps they’ll hit you like a match to a powder magazine. Pick them up and see. This review can be found on Goodreads & Amazon. K.M. Alleena is a Creative Writing Major at SUNY Oswego and has Anthropology and Native American Studies as her minors. Her primary genre is Poetry, but she has a deep love of Creative Nonfiction and Fiction. When she isn’t writing, she enjoys playing old video games and talking to parrots, often simultaneously. She has been published in her campus literary journal, the Great Lake Review, and also was a winner of Miracle Magazine’s Poetry Competition 2013 as well as SUNY Oswego’s Speak Up and SLAM! Spoken Word Poetry Event. This entry was tagged Blackbeard, book review, book reviews, books, devils fire, devils fire trilogy, Kate Lindsay, Matt Tomerlin, pirates, The Devil's Fire, The Devil's Tide, Tomerlin. Bookmark the permalink. ← All the Truth in the World is Held in Stories.